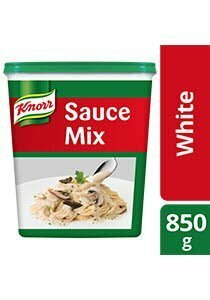 Knorr White Sauce Mix is made with real roux and buttermilk to create a rich and creamy sauce for use as it is, or as a base to create your own classic sauces. Creamer (Contains Milk Derivatives, Wheat), Roux (Contains Wheat), Buttermilk, Wheat Flour, Maltodextrin, Iodized Salt, Palm Fat, Monosodium Glutamate, Onion, Spices and Caramel. All food additives are of plant origin. May contain traces of cereals containing gluten, egg, fish, crustacean, mollusc, soy, peanut and tree nuts. 1. Dissolve 120g of Knorr White Sauce Mix in 1L of room temperature water. 2. Bring to boil with continuous stirring and simmer for 3 minutes then remove from heat. 3. Use cooked sauce as it is or as a pour over sauce for pasta, meat or vegetables.